Sophie Trudeau and Jaspal Atwal pictured in Mumbai Feb. 20. The Trudeaus attended a business and cultural event in the city that evening celebrating Indian cinema. 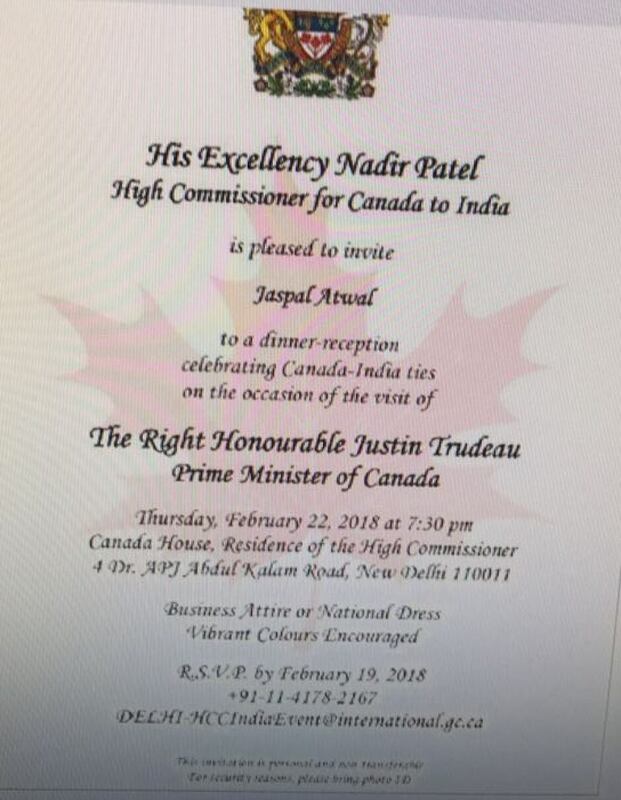 Jaspal Atwal, a convicted former member of an illegal Sikh separatist group, was invited to dine with Prime Minister Justin Trudeau at a formal event hosted by the Canadian High Commissioner Thursday in Delhi. The invitation, which was extended by Canada's High Commissioner to India, is being rescinded after CBC News asked the Prime Minister's Office about it. "I can confirm that the High Commission is in the process of rescinding Mr. Atwal's invitation," said PMO spokeswoman Eleanore Catenaro in an email to CBC News. Photos obtained by CBC News show Atwal posing for pictures with Trudeau's wife, Sophie, and Liberal cabinet minister Amarjeet Sohi at an event with the Indian film industry in Mumbai on Tuesday. His appearance at an official tour event could prove highly embarrassing for Trudeau, who has been at pains during his Indian trip to assure his hosts that Canada supports a united India and rejects violent extremism. Atwal, who did not travel to India with the Trudeaus' entourage, was convicted of the attempted murder of an Indian cabinet minister, Malkiat Singh Sidhu, on Vancouver Island in 1986. At the time, he was a member of the International Sikh Youth Federation, banned as a terrorist group in Canada, the U.K., the U.S. and India. He's also been convicted in an automobile fraud case and was charged, but not convicted, in a 1985 near-fatal attack on Ujjal Dosanjh, an opponent of the Sikh separatist movement who later became premier of British Columbia. ​Trudeau arrived in Mumbai Monday evening and stayed for a number of meetings on Tuesday before travelling to Amritsar and Delhi. On Wednesday in Delhi, Trudeau firmly insisted that he rejects Sikh extremism. It is not clear how Atwal got onto the guest lists at both the Mumbai and Delhi events. The International Sikh Youth Federation was declared a terrorist organization by the Canadian government in the early 1980s. Atwal was one of four men who ambushed and shot at Sidhu's car on a rural road on Vancouver Island in 1986, badly wounding him. More recently, the Insurance Corp. of British Columbia won a $28,000 judgment against Atwal over a stolen car ring involving Atwal's son, Vik, and dozens of others. Atwal has denied any involvement in the attack on Dosanjh, but admits his role in the attempt to assassinate Sidhu. 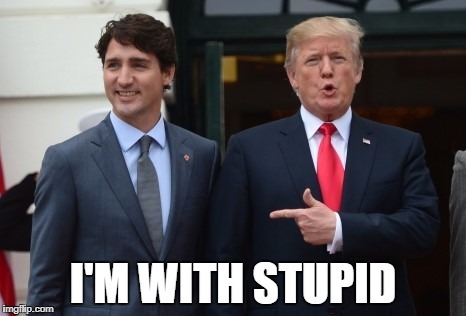 Can Trudeau really be this stupid? Why on earth would he invite this guy or even associate with him? Baffling, imho. Big deal, somebody, somewhere made a mistake on the guest list. GET OVER IT! Remember harper, he purposely, knowingly included criminals like Bruce Carson (had a criminal record as long as my arm) and Con artists like (Dr.) <- that's the Con, Don Meredeth doesn't have a doctorate. -Dean Del Mastro, the prime Minister ethics advisor and parliamentary secretary, the RCMP took him away to prison in leg-Irons and handcuffs, the first time in 60 years someone so close to the Prime Minister went to jail. -To avoid Criminal charges for election fraud senior Conservative party members, Irving Gerstein, Doug Finley, Michael Donison, Susan Kehoe have the Conservatives agree to pay a $230,000.00 fine. -Minister Peter Peneshue and associated Conservative Reb Bowers were charged with three counts of accepting illegal corporate contributions, an offense under the Canada Elections Act. -Author Porter with the silver tongue who was tarnished by a multimillion-dollar fraud scandal had spent two years languishing in a notorious Panama prison as he fought extradition back to Canada to face justice for his crimes. Wow, talk about people blowing things WAY out of proportion. It was a mistake, happens. They fixed it once they discovered the error. The question is how did the guy get that far in the political scene over there? Who exactly are we dealing with? OTTAWA — Justin Trudeau’s efforts to reassure Indian political leaders that his government repudiates violent Sikh extremism suffered an embarrassing setback Wednesday with the revelation that a Canadian Sikh convicted of trying to assassinate an Indian cabinet minister in 1986 has been invited to attend events with the prime minister during his visit to India. 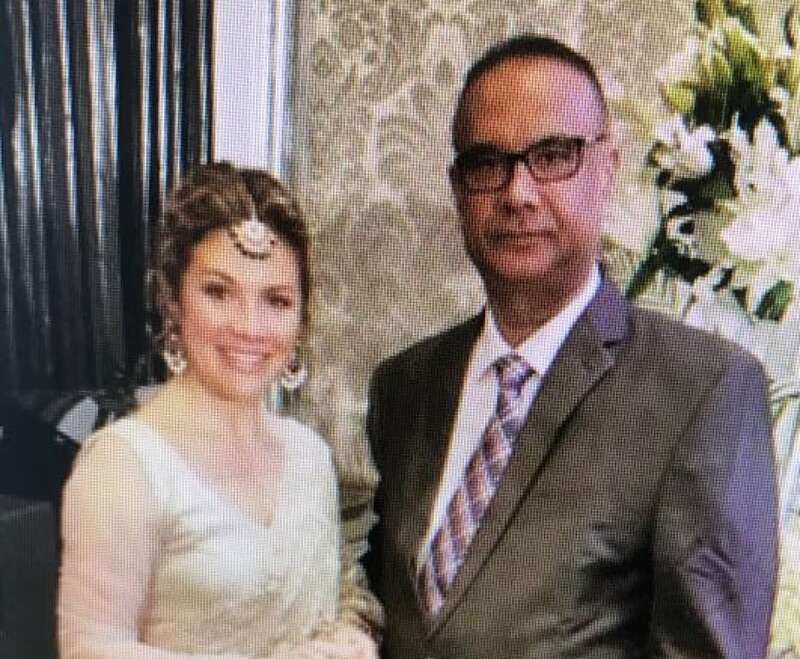 CBC News reported late Wednesday that Jaspal Atwal attended a prime ministerial event with the Indian film industry in Mumbai on Tuesday, where he posed for photographs with Trudeau’s wife, Sophie Gregoire Trudeau, and Infrastructure Minister Amarjeet Sohi. He was also invited by Canada’s high commissioner to India to dine with Trudeau at a formal reception Thursday in Delhi. CBC reported that the invitation was rescinded after the public broadcaster asked the Prime Minister’s Office about it. According to CBC, Atwal was a member of the International Sikh Youth Federation, a banned terrorist group in Canada and India, when he was convicted of the attempted murder of an Indian cabinet minister. He was one of four men who ambushed and shot Malkiat Singh Sidhu on Vancouver Island in 1986. But his presence raises questions about the adequacy of both security and diplomatic preparations for Trudeau’s trip. The news of Atwal’s involvement came just hours after Trudeau reassured the chief minister of Punjab, Amarinder Singh, that Canada supports a united India and condemns violent extremism. Singh has in the past called four Sikh ministers in Trudeau’s cabinet “Khalistani sympathizers” and last year refused to meet with one of them, Defence Minister Harjit Sajjan. After his meeting Wednesday with Singh, Trudeau reiterated his position that Canada supports a united India and absolutely condemns violence for any cause, but will not crack down on those advocating peacefully for an independent Sikh state because that is a freedom of speech issue. Every time Trudeau tries to bilk the taxpayers and sneak away for an all expenses paid junket with his wife and kids, he ends up embarrassing Canada and Canadians with his ridiculous behaviour. It really shows the incompetence of not only Trudeau, but of his whole staff and ministers when they find themselves in trouble like this all the time. When you're trying to screw someone over like the taxpayers who are by in large much more intelligent than you are, it always ends up bad. Perhaps Trudeau should just stay home. Yes, he might have to answer questions to the people who pay his salary that way, Canadians, but at least the rest of the country doesn't have to hide its face in shame with embarrassment from diplomatic snafus on the world stage by this clown. justincase wrote: Big deal, somebody, somewhere made a mistake on the guest list. GET OVER IT! Like you’ve gotten over the litany of sins you believe the Cons committed? We’ll be over this one soon. On Trudeau’s ocean of moronic gaffes, there’s always another wave to ride. Chyren wrote: Wow, talk about people blowing things WAY out of proportion. It was a mistake, happens. They fixed it once they discovered the error. The question is how did the guy get that far in the political scene over there? Who exactly are we dealing with? He is the leader of a major nation of the planet. Being and OOps OOps OOps leader is unacceptable. Why do you feel it's fine. Should you find out they are "family friends" like many other of the Trudeaus list of "oh well we knew them" people who are nothing other than a class of wealth like we will never see makes you appreciate this individual. Sure the guy was convicted of trying to kill someone, pfft that's who we want our leader of the country visiting with....well you know as long as they have enough $$ you can forgive it. Interesting that exact same thing could be said about Trump. Javino, 55, was convicted in 1991 of possessing a Molotov cocktail outside a couple’s home, according to Newsday. Seems like in Trudeau’s case some other MP dropped the ball, and Trudeau ended up at an event with this man who got a picture standing next to Trudeau’s wife. Now the usual suspects are using this as a way to attack the PM somehow. It’s much ado about nothing, and just a diversion from the cooperation and investments made between these countries, jobs they will create, and overal benefit to the country. But yeah, sure ignore everything in favour of some staffer’s error. I wonder though, did Trudeau’s India trip cost as much as Harper’s? Harper spent close to 2.5 million. Including the armoured cars he had flown out with him. Trudeau did bring a celebrity chef with him though. It's only an "all-expenses paid junket" when the person travelling is someone you don't like. If we're okay with the guy then it's just a business trip. Omnitheo wrote: Interesting that exact same thing could be said about Trump. SO why is one ok with you but not the other? But Harper is still a respected leader and was received in India with great respect. Trudeau looks like what he is a drama teacher dressing up in costume and playing a part. Hell, even JT does it repeatedly in Question Period himself. Instead of answering the question (they can't), it's much easier to try and point at something else or use strawman arguments.